Contributors publish their research on aspects of local history; has been produced annually since 1992. Click to view full index of articles. Individual articles from Bulletins 2 to 26 and Bulletin 1 (2nd edition). With the support of THS, John Dixon has published his labour of love – Tewkesbury’s Two Forgotten Railways – along with a reissue of Roger Butwell's 2011 commemoration dvd. Fuelled by Milk is a new publication (2017), that not only replaces Harry Workman's memoirs vols 1 & 2, but also adds a new chapter written by Roger Workman, celebrating the 80th anniversary of Cotswold Dairy. A history of all those from Tewkesbury who lost their lives because of the 'Great War'. 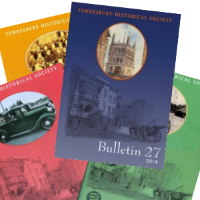 Anthology of articles published in Tewkesbury Direct newspaper. Then & Now Volume V follows the same format as previous volumes but concentrates on the history of the High Street shopping centre (the 'Kremlin'). By John Dixon, “Never has so much been owed ...”. A memorial to those of Tewkesbury and district who lost their lives in World War II. A combined book and CD-ROM: Anthony Skelsey, History of Tewkesbury Municipal Cemetery and Mike English, Cemetery Database (contains burial records 1857-1962; cemetery burial plots; Bennett's list of cholera victims). History of Tewkesbury’s War Memorial. By Sam Eedle, an account of the life of Arthur Harrison, a teacher in Tewkesbury killed in World War I.